Vladimir Vacić, Ph.D., Senior Scientist, Computational Biology, 23andMe, Inc.
Did you know humans interact with their smartphones 2,617 times per day? Surprising, right? Fortunately, not to the panelists of this session. These wearable and sensor technology experts spent the remainder of the day exploring how popular consumer technologies can be applied in clinical settings to lead to better patient outcomes. When it comes to creating a new digital technology, the panel agreed that companies should do as much as they can to understand what it would take for the masses to adopt the product. Ensuring that it’s part of consumers’ natural workflows for managing their health is the best strategy for increasing the likelihood of consumer adoption. 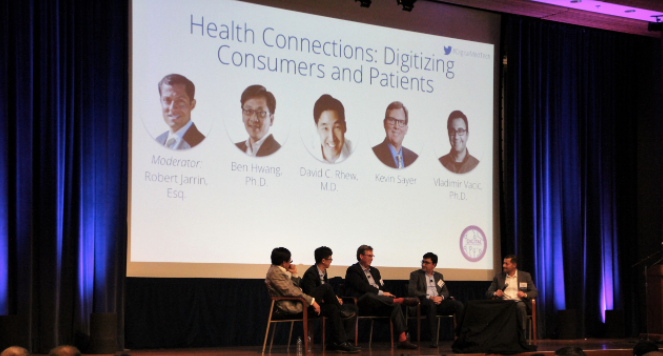 Panelists also explored the future of value based care, and how it will change the health care industry. The experts agreed that the industry should strive for technologies that are fully vetted and allow the patient to go home, but still receive monitoring. The benefits of technologies like this are endless, including fewer expenses, faster recovery, and more. The session also touched on the importance of data, specifically as it relates to how organizations share data to build a better product. The panelists agree that organizations should always strive to be data-driven, but they should also strive to be transparent with their data, not only with the consumer but also with partner organizations, too. This interoperability and sharing of data with partners will lead to better, more effective products. As the session ended, the moderator, Jarrin, asked each panelist a perfect question to wrap up The Digital MedTech Conference: What’s the future for digitized health?